Our smoke sauna (rökbastu) is of old Finnish design. It was used both as a sauna and for the preparation of flax. During this process, the furnace was heated for several days before the warm flax was prepared quickly in a number of steps. As this was a labour intensive process, women from several farms would come and work together. 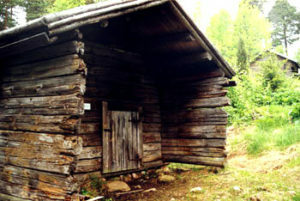 The sauna was donated to the homestead museum in 1928.